Quality overdrive with a neutral tonality that should work well with any sort of amp. 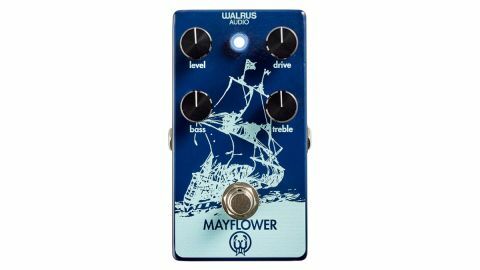 The Mayflower is a low-to-medium gain overdrive. With the Drive control at minimum and Level anywhere above two o’clock, it offers a clean boost with just a touch of grit. And it’s tonally very transparent, keeping your tone intact unless you want to use the Bass and Treble knobs for a bit of enhancement. We like it with just a touch of extra top for added sparkle. or one that’s just breaking up, and will add dirt while retaining articulation. We particularly liked it for adding a cutting edge to rhythm work or putting a bit of hair on single notes for edgier country-style picking. It also stacks very well with other dirt pedals to give them a natural-sounding extra gain stage.